Eexecutives in most organizations think they have no problem with software license compliance. Until the auditors suddenly proclaims a different truth – and then it can be expensive. License compliance is a real challenge for most organizations. Licenses should not be managed manually. With our SAM solution Software Management Suite, our customized SMO SAM managed services, and SMO solution support the documentation of your technical and commercial inventories and the acquired rights is simple. Overpayment is no longer an issue and report obligations are fulfilled automatically. In brief Software Management Suite is a scan engine, a collecting server, and a user interface. The server component mainly imports collected scan data from all systems to SQL Server. The objective is to obtain a most complete and realistic picture of your IT environment. For this purpose, Windows 32bit, 64bit, Itanium, Citrix, VMware, Apple Mac and Linux systems are scanned. Finally the documentation of the commercial environment. Software Management Suite uses Microsoft SQL Server. Currently, SQL Server 2008 R2 Standard is included. All necessary services such as SMOscan Server, IIS and SQL Server can be installed on different servers or using a single server. Basically, no scan clients are installed. SMOscan is usually distributed via Group Policies or login scripts and tasks. Thus, a project for a short baseline project gets complete results and it is optimized for long-term processing. SMOscan is highly scalable and runs with low priority. Used during Terminal Server, VPN and VDI sessions SMOscan notes that there is a session. Subsequently, the analysis of which device is accessed occurs. Finally, data for the “Microsoft Remote Use” licensing will be collected during the inventory evaluation. In order for a maximum licensing in these environments is effectively prevented and achieved an increase in efficiency of your license management. The import from the Microsoft License Statement (MLS) is provided. Did you get an audit letter? We provide experts! For Audit and True-ups you might need experts at short notice for accurate figures and risk avoidance. Use SMO Audit and True-Up Services and you have the experienced experts and tools onboard. True-Up Dates or end of contract – now what? If deadlines are missed, important financial benefits end by eg discontinuation of Software Assurance. The SMO SAM expert team accurately create all necessary documents very fast. SMO True Up SAM services provides the relevant analysis and ultimately the True-Up Report. SMO True Up Report Enterprise provides the special software support for the preparation of reports on top. Mergers & Acquisitions without risk! Your investment for a new company is considerably higher when it becomes clear that they “saved” on licenses. Until you discover that it might be too late for renegotiations. Minimize your M&A risk and use SMO M&A services. With certified professionals and tools onboard. The fully qualified SMOscan retrieves data with a focus on software asset management. For example, the edition of SQL Server, Exchange Server, DB2, Access and many others differed titles. Data quality has a huge impact on the resulting effective license position. The reconciliation report analyses the rights of licenses and contracts as well as installations. Depending on the metric and update and downgrade rights are used automatically. Every license balance report can be filtered by cost centers or organizational units. The completeness and accuracy of documentation and the analysis by the license balance and Effective License Position (ELP) is confirmed by KPMG. Access to Terminal Server and VDI systems are automatically documented and mapped to the accessing device. For license compliance Microsoft Remote Use Rules are applied. Therefore a license will only be needed for Microsoft applications on use even if it is a device license like Project. Primary user rights are applied as well. VMware ESX is automatically documented and license compliance data is calculated for the last 90 days. Data centers, clusters and virtual machines from vCenters and ESXi’s are imported to Software Management Suite and virtual machines are assigned to the hosts. This 90 day history is respected because of shifts of VMs from host to host. Potential shifts are not considered, but factual values. Software Management Suite imports XML data to automate processes. E.g. the retirement of computers can be transferred from a ticketing system as an XML file and software management suite imports that file to delete the system and moved back the unneeded licenses to the pool for further use. Fast and safe import of MLS data now with FPP, OEM and additional data such as cost per license, currency and serial numbers – as well as import data from other manufacturers. 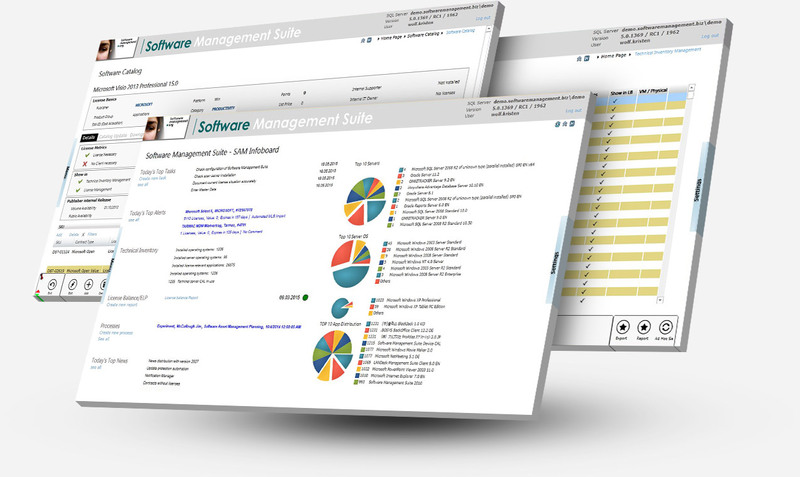 Software Management Suite is fully installed within a few minutes. Adaptation, customizing and scaling can take from a few minutes to several days depending on complexity of the IT environment. In general, the installation is completed in a day. ISO 19770–II Software-Tags are scanned by SMoscan. This improves the detection rate of difficult to be recognized products. Software Management Suite’s product identification engine uses a reference database for perfect recognition. The implementation of Software Management Suite and the SMOscans is carried out in a few minutes. However, the adjustment may take some time depending on complexity of your IT environment – from a few minutes up to several days. In particular, when many offices, complex network structures, and reporting requirements are involved. Basically, no scan client will be installed unless it is really required. SMOscan is initiated through Group Policies / Login Scripts (workstations) and GPO / tasks (Server). Thus, the solution is very reliable, flexible and quick to implement. SMOscan only runs at low priority. The scan period as the scan itself scalable and is set to the operational needs. Thus, high-availability systems can be inventoried without performance loss. As additional information for System specialists we recommend the SMOscan documentation: SMOscan – Introduction in 15 Minutes. Running in Terminal Server, VPN and VDI sessions SMOscan notes the session. Subsequently, the analysis of which device is accessed occurs. Finally, data for the “Microsoft Remote Use” licensing will be collected during the inventory evaluation. In order for a maximum licensing in these environments is effectively prevented and achieved an increase in efficiency of your license management. The license balance report and the Effective License Position (ELP) are claimed to add to the commercial data available. An import from the Microsoft License Statement (MLS) is provided. Hardware requirements for Software Management Suite are very low. These requirements are linked to the very moderate requirements of Microsoft SQL Server and depend on the number of managed systems. The solution uses Microsoft SQL Server as a database system. Processing requires the database system and the underlying I / O system. Consequently, the Suite is benefiting particularly from fast I / O disk systems. • HDD from 10GB, RAID level with good aptitude for databases. • If less than 1000 to be scanned devices lower CPU values are possible. • The operating system we recommend Windows 2008 or later in 64bit mode. For virtualized systems, please make sure that the connected storage systems are performant.